Who doesn’t love a good “Treasure Story”?!! I’m sure we’ve all, at some point, dreamed of striking gold, or have at least been struck with curiousity over a story of buried treasure or sunken treasure ships! Something about it strikes our interest and imagination. 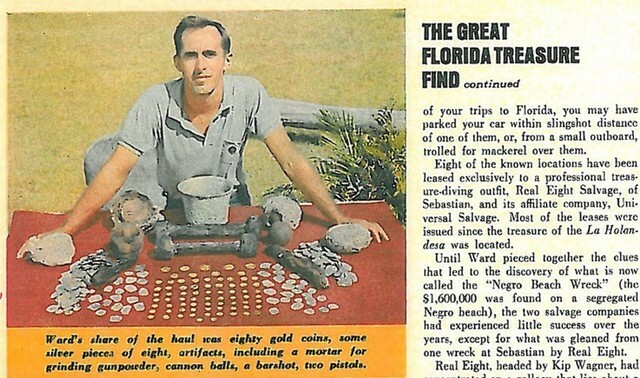 We have recently been hired by the Estate of Bruce Ward, who was one of a small group of individuals who actually got the privelege of living out one of these incredible “Treasure Stories”! We are excited to help tell his story, and hope that you will enjoy it too! Bruce Ward of Jerusalem, AR passed away on December 15th, of 2018. Though he spent the later years of his life in the remote hills of the Ozarks, his earlier days were spent livinig in Vero Beach, Florida. The story, however, begins much further back, in the early years of the 1700s. Back in the years of European colonization of the “New World,” rulers would frequently send their royal fleets across the oceans to their American colonies and settlements, in order to bring the new-found riches back to the motherland. In July of 1715, the Spanish Plate Fleet, loaded with untold sums of treasure from Spanish-American colonies, perished in a hurricane in the Florida Straits before they could deliver their bounty back to the crown in Spain. Eleven of the twelve ships in the fleet were lost. This was one of the worst sea disasters of all time. The Spanish made a massive recovery effort in the coming years. The Spaniards are able to salvage some, but not all, of the vast treasure. Eventually the salvage efforts are abandoned by Spain, locations of the wrecks are lost, and the rest of the treasure lay in waiting for nearly 250 years. Fast forward to the 1950s & 1960s… This stretch of Florida coastline has always been notorious for washing items up on their beaches, especially after heavy storms. 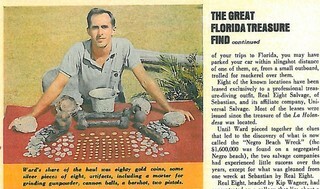 Items such as silver & gold goins, pottery, and fragments of wooden ships would not be uncommon to find. Bruce Ward was drawn to this stretch of beach in the mid 1950s and landed in Vero Beach, Florida. He started his search with the simplest of diving equipment: a mask, fins, and an inner-tube fashioned with a peach-basket inside to hold artifacts that he brought up. Upon following clues from coins he’d found that had washed up onto the beach, he eventually determined that he had finally located one of the ships from the 1715 Spanish Fleet. Ward later partnered with a large company to recover artifacts from this particular wreck. All total, approximately $1.6 million (according to 1960s figures) was recovered. In Bruce’s personal collection of artifacts recovered, he had several cannon balls, pieces of the ship, and even a pair of flintlock pistol fragments that tell a story all their own, of the effects of a 250-year stay at the bottom of the ocean. But the most interesting and captivating of the 1715 Fleet items has got to be the coins! GOLD & SILVER! I imagine Bruce’s excitement when he uncovered his first shiny gold object. Of the thousands of coins ever recovered from these wrecks, only about 2% had visible dates on the faces. Bruce had several coins containing dates from 1712 to 1714. These artifacts laid at the bottom of the ocean, just off the coast of Florida, for some 250 years until they were discovered by Ward. He cherished his historical finds, and they made their way with him to Jerusalem, AR where Bruce spent his later years. Now, in the coming weeks, we will be preparing to offer these items to the public at auction. It is my sincerest hope that we can get these incredible artifacts into the right hands so that they can be appreciated and preserved as part of a rich history, forever! I, for one, am very honored to be a part of such an interesting story! This auction is coming soon! Online bidding will be available once we finish our inventory and photography process.